AC/DC launched their Rock or Bust world tour with a headlining set at the Coachella festival on Friday. The band performed a 20-song set full of classics alongside three tunes from “Rock Or Bust”, including the lead single, “Play Ball”, “Baptism By Fire”, and the title track. The event marked the return of guitarist Stevie Young and drummer Chris Slade to the lineup following the retirement of founder Malcolm Young and a series of legal issues faced by longtime member Phil Rudd. 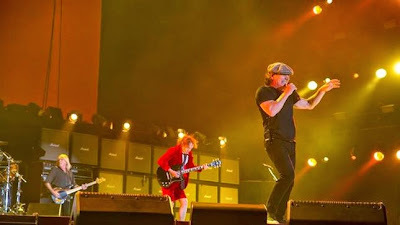 AC/DC spent the week before their Coachella debut rehearsing in 6-hour daily sessions for the event, with frontman Brian Johnson revealing he received some advice about performing at the festival from Paul McCartney, who played Coachella in 2009. "But he said it's great because you're doing your thing, and eventually all the kids go, 'He's cool, this dude!' It kind of takes you right back to the start, when you had to win over an audience. I'm excited." AC/DC will headline Coachella again on Friday, April 17 before launching a European tour May 5 in Arnhem, Netherlands. AC/DC will begin a late summer/early fall tour of North America August 22 at Gillette Stadium in Foxborough, Massachusetts.